In this new series of posts, we're going to take a look at some of the dichotomies of the art world: the most influential artists and the rising stars, the well-known and the unknown, the sought-after and the reviled. Sometimes, as in the case of this week's post, it will be up to you to decide which categories the artist falls into. 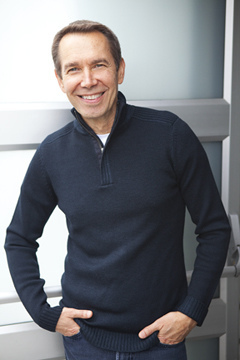 Jeff Koons is a very polarizing force in the contemporary art community for a number of reasons, but his staying power and his influence cannot be denied. As we discussed in a previous post, Koons currently holds the world record for highest auction price attained for a work by a living artist, when 'Balloon Dog (Orange)' sold recently for over $37 million USD. Koons tends to work in a series modality, creating a number of works in a specific series as he explores various themes related to the series. The Balloon Dog sculptures, for instance, belong to a series he calls 'Celebration'. It's one of his most well-known series, largely because of the headline grabbing sums of money attached to the sale of the pieces. They feature a variety of large sculptures executed in colourized, highly reflective stainless steel. The really interesting thing about Koons' work, though, at least in this writer's opinion, is the way he deals with criticism and with meaning. He claims that his works have no hidden meanings, that there is no sly satirical laughing up his sleeve at the modern art establishment, and yet that's exactly how many critics seem to view his work. This is probably at least partially informed by the way in which many of his pieces are constructed. Perhaps taking a leaf out of Andy Warhol's Factory book, Koons developed a 'colour-by-numbers' system that allowed his legions of assistants (over 100 at the latest count) to produce his works while staying true to his original vision, as though they were created "by a single hand". "I think art takes you outside yourself, takes you past yourself. I believe that my journey has really been to remove my own anxiety. That's the key. The more anxiety you can remove, the more free you are to make that gesture, whatever the gesture is. The dialogue is first with the artist, but then it goes outward, and is shared with other people. And if the anxiety is removed everything is so close, everything is available, and it's just this little bit of confidence, or trust, that people have to delve into." An interesting idea, but at least at the moment, it seems like he's removed so much anxiety by not actually being involved in the production process of any of his work. In this critic's opinion, it's something of a cop-out.